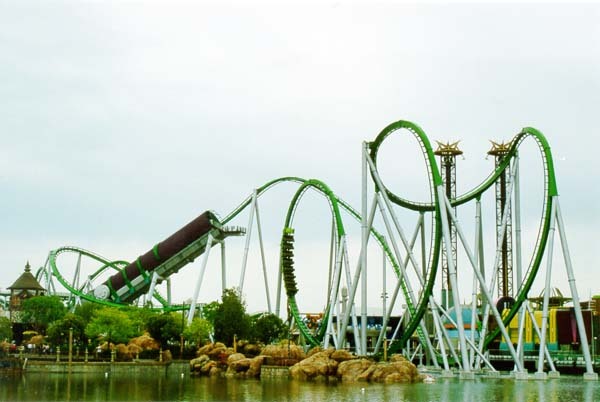 One of the big attractions at Universal Studios Orlando is The Incredible Hulk Coaster® found inside Islands of Adventure! Upon entering the queue for the roller coaster you are surrounded by the lab equipment of Bruce Banner. As a volunteer for his experiment you await your turn to help him solve how to reverse the effects that caused him to become the Hulk. 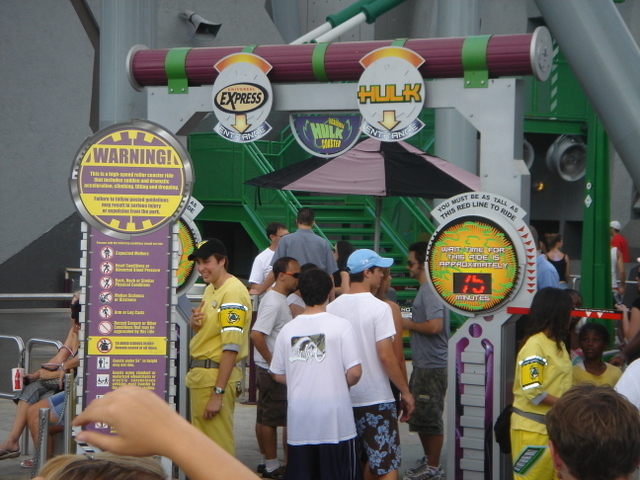 You can take in the story of the Hulk on the many conveniently placed monitors, as well as the generator, gamma core, and towers of power while listening to or watching through the windows as the roller coaster rips past. After waiting you will be seated into one of the seats of the car, and pull down your harness and strap in. Banner begins the experiment, but it appears there is a malfunction and you are launched up the gamma tunnel from 0 to 40 mph in 2 seconds directly into a zero-g roll. After a cobra roll the car enters a vertical loop, and is launched through a misty tunnel which then completes a corkscrew. The length of the ride is approximately 2 minutes, and experiences 1.42Gs during the launch, has 7 inversions, reaches 67 mph, has a largest drop of 105 feet, and reaches a max height of 110 feet.